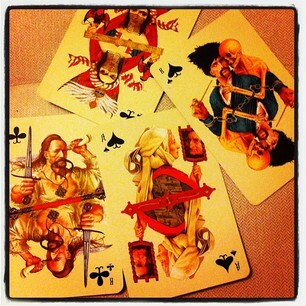 Recently I have been immersed in the playing cards quite a bit. 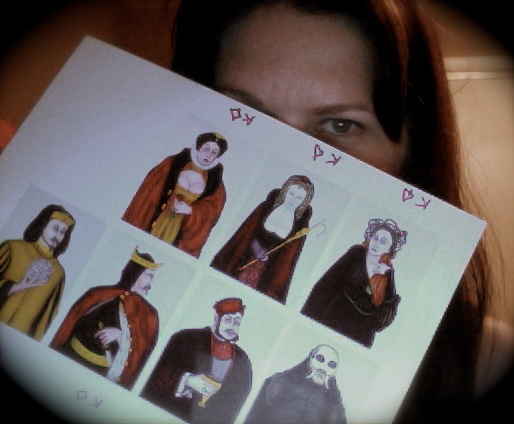 I think it’s all started after I spiritually committed myself to Ana Cortez’s upcoming deck — The Book of Knowing. In contrast to other authors and deck creators, Ana has graciously allowed, and even encouraged, reproducing the paintings her father, C.J. 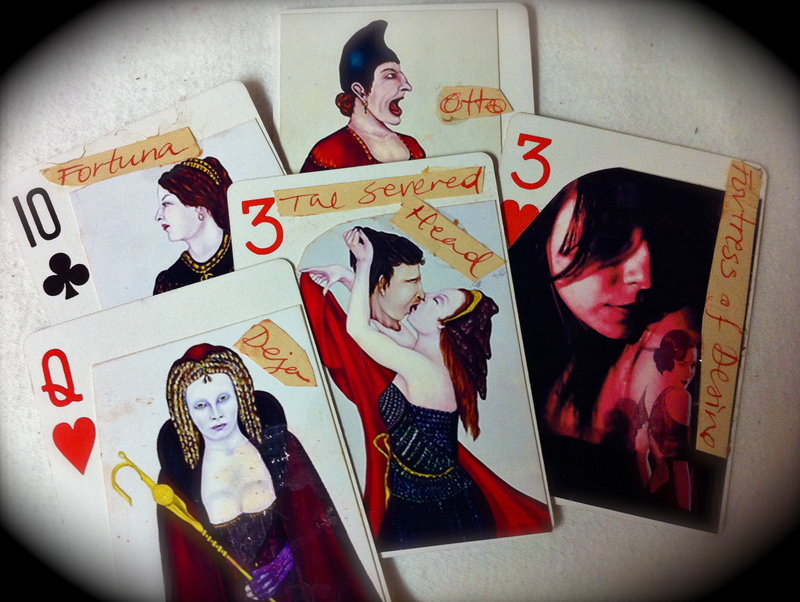 Freeman, had channeled and manifested, to make a personal playing cards oracle deck. I downloaded the images and mounted them onto a regular deck of Bicycle brand playing cards. 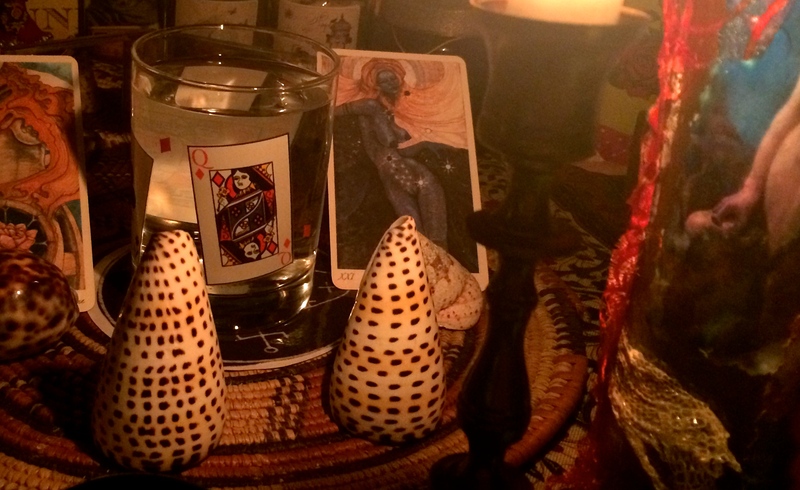 And then, when my own version of The Book of Knowing was finished, I communed with the elements, circling under an Aquarius Full Moon, ritually dedicating myself to the cards. Since then, I have been obsessing over unique and vintage playing cards decks on eBay. Mainly, I got some amazing Russian and Ukrainian decks — while being especially fascinated by the wonderful art of Vladislav Erco and his Taras Bulba inspired cards. 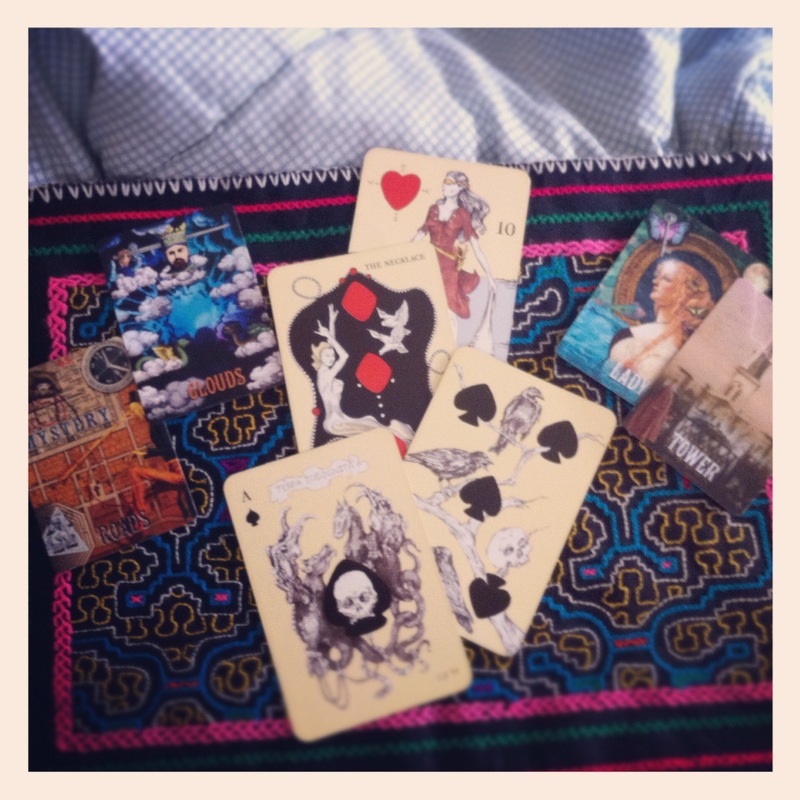 After following my own divinatory interests for many years, and spending a lot of this time in the intrigues of tarot, I came back to roots and requested my mother to teach me her way of reading the playing cards. She wasn’t very interested. “I don’t know how I do it,” she said. “Well, how did you learn to read them to begin with?” I wondered. She couldn’t remember. “I think I learned it from an old gypsy lady… Hmmm, maybe not. I really don’t know.” I wasn’t surprised. My mother’s memory is like Swiss cheese. After all, she can’t even remember what time of day I was born. “I think it was early afternoon, Nadyusha. Maybe it was late afternoon. Probably after 5 PM. Wait, maybe it was midnight.” It doesn’t matter really because my mom is an amazing reader. Or, as my dear Californian friends would say: She’s right on! But here’s the deal — My mother’s style of reading is not psychological, Jungian, or archetypal. It ain’t based on astrology or the seasons. She uses very basic, pre-assigned meanings for each of the cards. She works within the permutations of these meanings, filling in negative space with brilliant intuition. I am going to share with you the card meanings my mother has shared with me. For this purpose I’ve translated them from Russian. The intuition part, however, is your own business! An older female, often divorced, and older. Could also represent a female in an official position. A female, or a sweetheart (if reading for a male client). Her Life. Worries of the client or his / her love interest. A tough love situation. A financial (official) interest. Love of a “Hearts” individual. Love of a “Clubs” individual. A bed of an unmarried individual. The bed of a “Hearts” individual. A lucky card. The bed of a of a “Clubs” individual. Thoughts and conversations of an unmarried person. Thoughts and conversations of official matters. Thoughts and conversations of a client or their sweetheart. Thoughts and conversations of a “Clubs” individual. A meeting with a younger, unmarried individual. A meeting with an official, or a much older person. A meeting with a sweetheart. 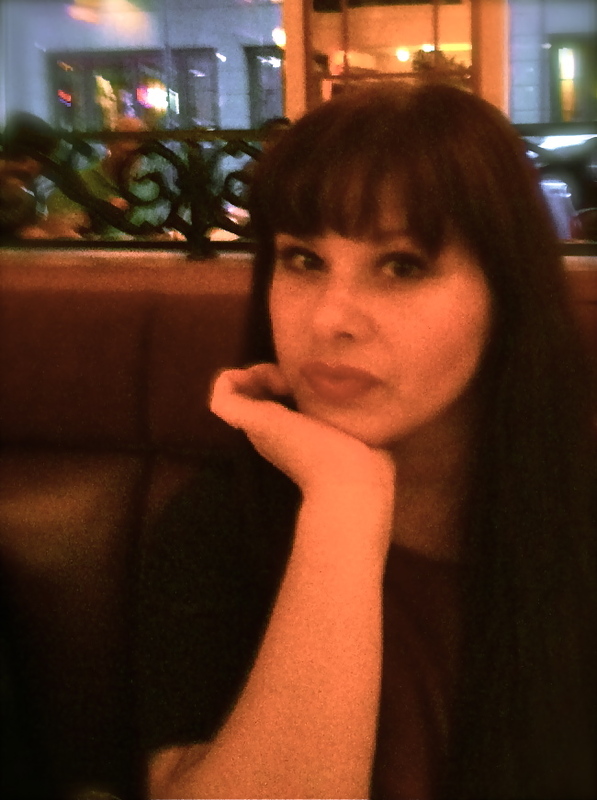 A meeting with a “Clubs” person. A path, a way of a younger, unmarried individual. A path, a way of a client or their sweetheart. A path, a way of a “Clubs” person. An official structure (hospital, bank, office, etc.) Also a bad luck card, especially when the Spade is pointing down. A client’s or their sweetheart’s home. A home of a “Clubs” person. As you can see, these are very basic meanings. Coming down from a tarot reading perspective, it is almost more complicated to be able to read such simplified combinations. There are more intertwined nuances my mother uses in her card reading, but this is the basic skeleton of information she follows. If you happened to miss the Hoodoo Rootwork Radio Show last Sunday, here is an archived recording of the show. 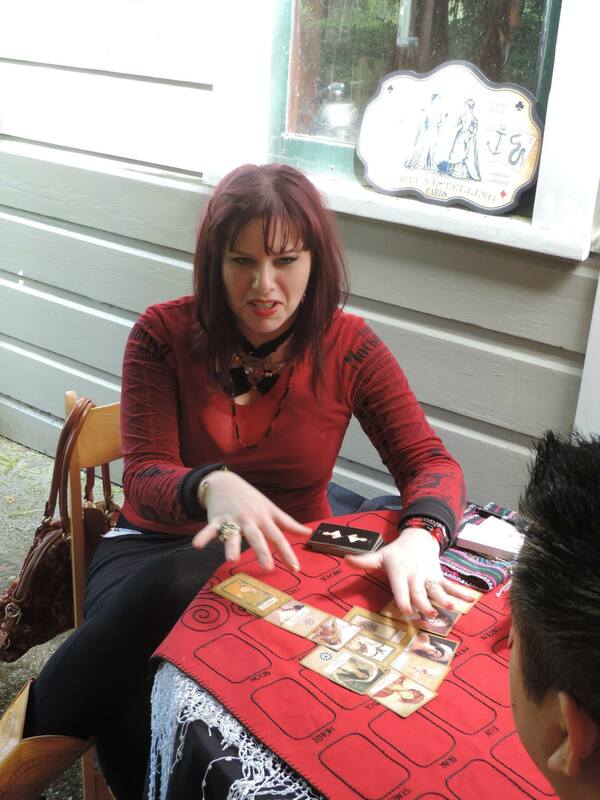 Along the hosts, who were using the RW tarot, I was divining with the Lenormand cards & Ana Cortez‘s fabulous Playing Cards Oracles. The show was loads of fun, and I can’t wait to do it again. Though I was very nervous, since it was my first radio appearance. 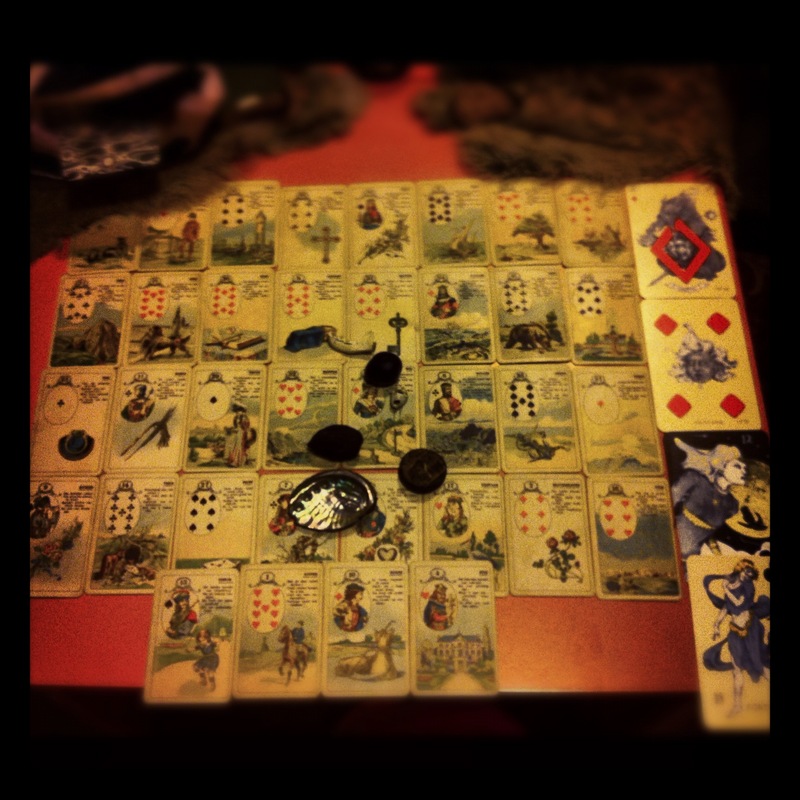 I absolutely love using the Lenormand and playing cards for conjure-type readings and for Spirit work. I find both systems to be very practical, and give not only accurate predictions, but also naturally offer natural suggestions for rootwork and magical remediation. After all, two-headed doctors from the old South often used playing cards as their divination tool, along with bones, and scrying. 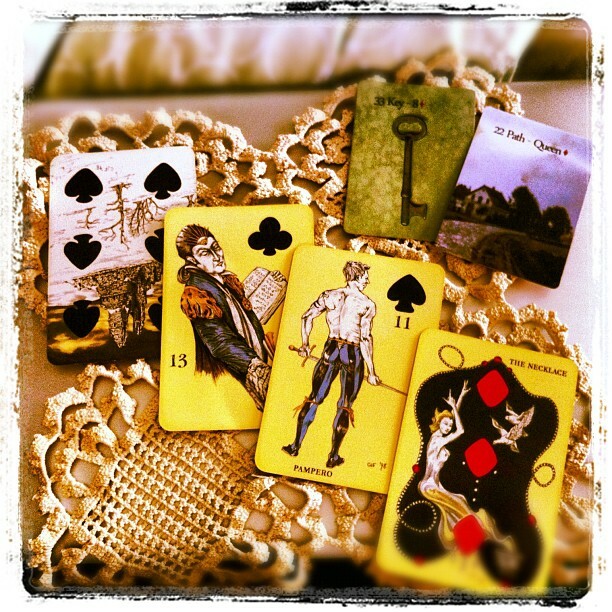 Do you use your Lenormand or another deck, other than tarot, in any type of Spiritual work? I’ll be on the Lucky Mojo Hoodoo Rootwork Hour this afternoon! I wanted to make sure y’all knew I’ll be today’s guest on the Lucky Mojo Hoodoo Rootwork Hour on Blog Talk Radio. The hosts, catherine yronwode, ConjureMan Ali, and yours truly — Madame Nadia of AIRR — will provide 90 minutes of free readings and conjure consultation, while offering an education in African American folk magic. The Lucky Mojo Hoodoo Rootwork Hour will air at 3pm PT, 6pm ET. Please tune in online, call in by phone 818-394-8535, or ‘Click-to-Talk’ via a computer interface. Join in chat using a registered account. For all of you card lovers, I am planning to use the Lenormand system and Playing Cards Oracles, by Ana Cortez. I am über excited! And I hope to connect with all of you this afternoon!!!! I am so excited to share these awesome news with all of you! My mentor and friend, Ana Cortez, the author and co-creator of the Playing Cards Oracles is raising funds to publish a second deck. I find this upcoming project very exciting, and am planning to support it personally as well. I thought I’d share the information with you, so you too might participate in the manifestation of this new and brilliant playing cards deck. Read more about this extraordinary project on Ana’s site. For this week’s forecast I laid out the Grand Tableau, using my vintage Carta Mundi deck. I also drew 4 cards from the Playing Cards Oracle deck, and cast some bones. Abalone (open); John the Conqueror; Blocked Cowrie (coconut top); Cowrie (upside-down); Buckeye; Wiesel Jaw (facedown). Formation resembles the Hebrew letter Gimel. For a while now I have been planning on updating my YouTube boudoir with a current video. 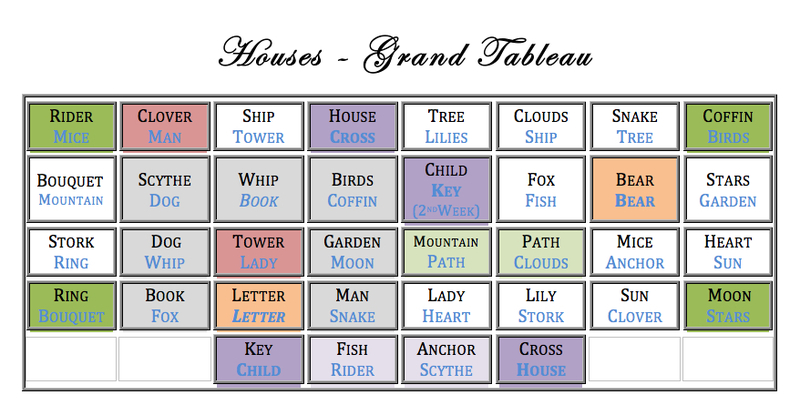 Mainly, I wanted to share my approach of using multiple divination systems with one sitter, during a single session. Recently, I received a request from a delightful young lady who wanted to have her fortune read regarding a relationship concerning her ex-boyfriend. 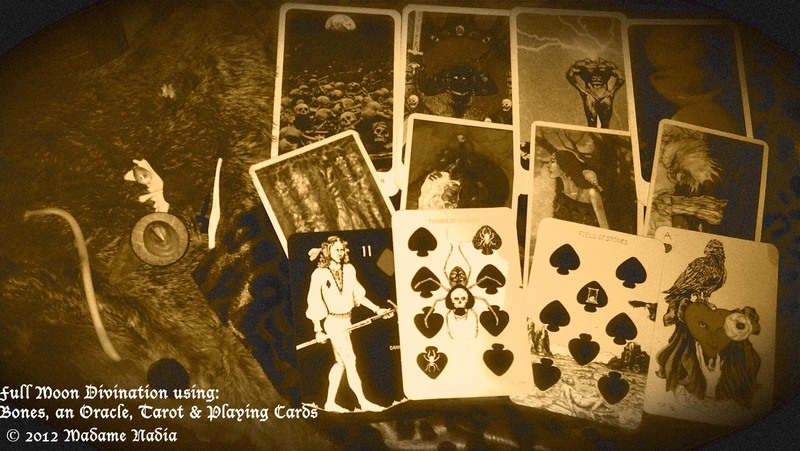 I took this opportunity and recorded the reading, demonstrating the incorporation of three different systems of cartomancy — the Silent Tarot, Playing Cards Oracles, and ARLO Lenormand — into one, very potent, divination consultation.